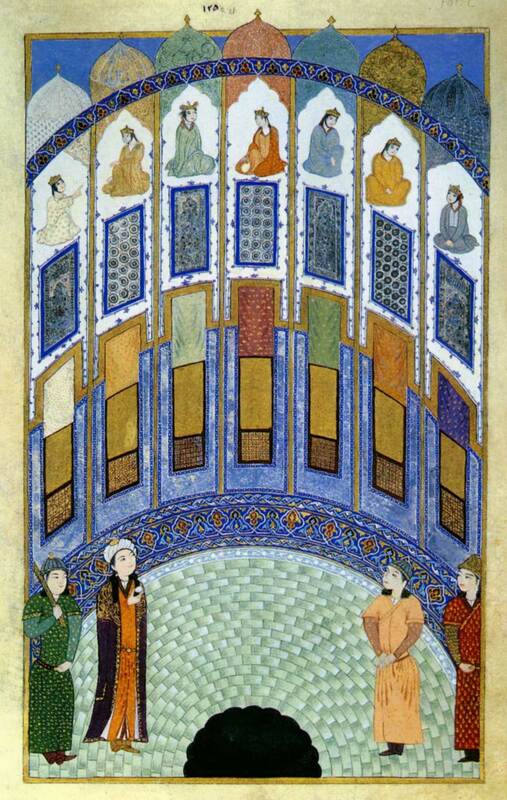 This entry was posted in image research, inspiration and tagged illuminated manuscript, persian. Bookmark the permalink. That black semicircle and tile become all the more compelling because of the compression of perspective, with the figures placed against a floor that works visually like a wall, forcing our eyes even more upward. Well said, yes exactly. Glad you liked it. Thanks a lot for putting the picture here. I looked everywhere to find it in large size. That probably wasn’t black at first. That circle is a pool. They painted water with silver color in Persian paintings. The silver parts were oxidized then as time passed by. Glad you found it. It’s scanned out of text book. I couldn’t help myself. Of course that’s silver leaf — why did I not realize that? Thanks for the info.